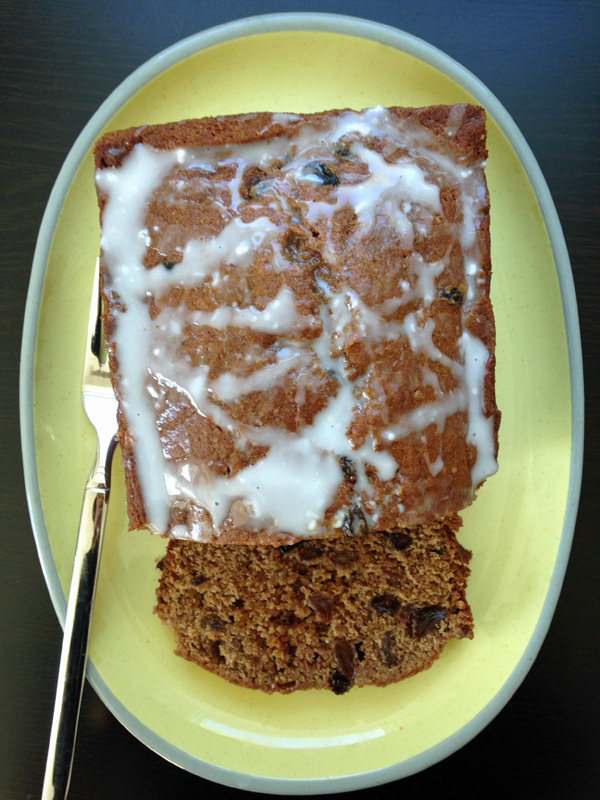 I made a cake from my Gramma’s recipe box this week – A Man’s Favorite (Applesauce Cake). It was a perfect cake for a weeknight fall meal – simple flavors, ingredients I had on hand, fast to mix up, and made a smaller-than-most sized cake. 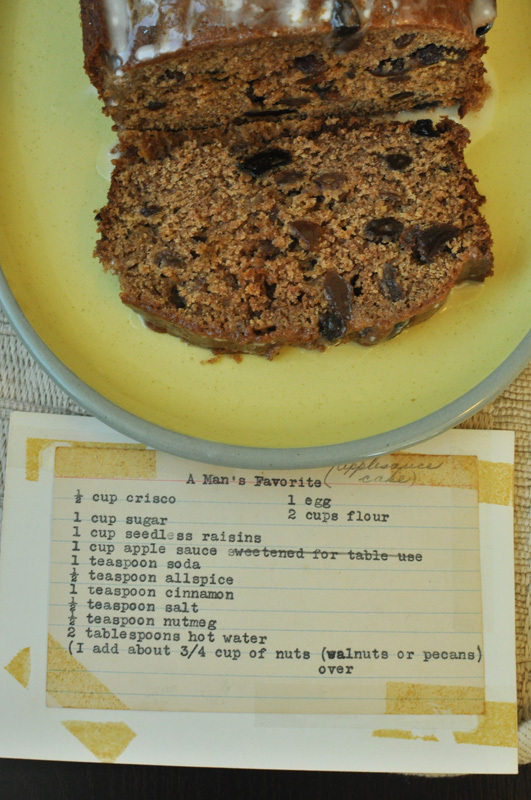 My gramma got this recipe from a friend of hers from when they lived in Texas – I just love her penciled in addition of Applesauce Cake after A Man’s Favorite. I have to wonder if someone was being cheeky naming the cake this, or were they serious and it was the man’s favorite? 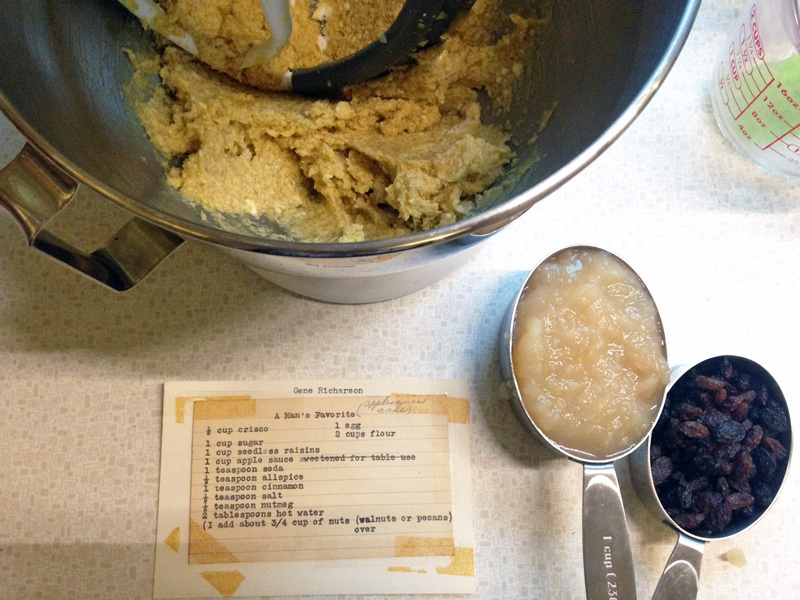 I especially liked the addition of my homemade applesauce and a full cup of raisins. I added a quick powdered sugar glaze by whisking together until smooth: 4 tablespoons powdered sugar, 1/8 teaspoon vanilla extract, 1-2 teaspoons almond milk. I don’t have much to report on right now – I’ve been busy with some big projects at work, wrapping up some artworks and fun decorating ideas at home, and I have been trying to squeeze in as much outside time as I can right now. It is the most ideal weather right now, in my book, 50s and 60s in the mornings and 70s in the afternoon. Walking, biking, and enjoying my fair city has been at the top of my agenda. Blend crisco, sugar, and egg thoroughly in one operation. Add raisins and applesauce. Then add the spices and salt with flour, and add in several portions. Before the last of the flour is added, stir in the soda dissolved in hot water. Beat well, pour into a greased loaf or tube pan and bake about 1/2 hour in a 350°. (I found it to take about 1 hour to bake thoroughly, but test it with a knife, in the center, to see if it comes out clean). And I do. However, the things I love are not as important as the people I love. Gramma came to visit me in Greensboro one fall. She requested a visit to my classroom to see me in action. 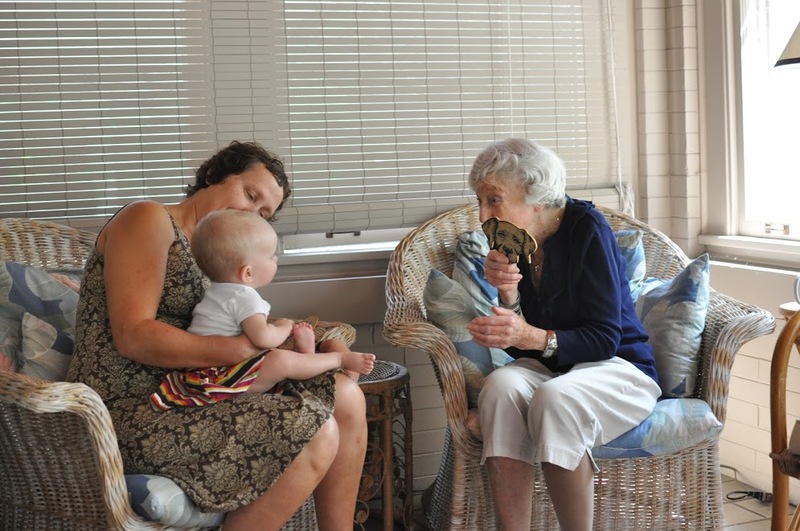 My Gramma (Gigi, as she requested to be called by my Greta) passed away, quite suddenly, at the end of August. Mary was a spunky 90-year-old who was still driving, playing bridge, making her own grocery store runs, and calling me weekly to schedule our visit. 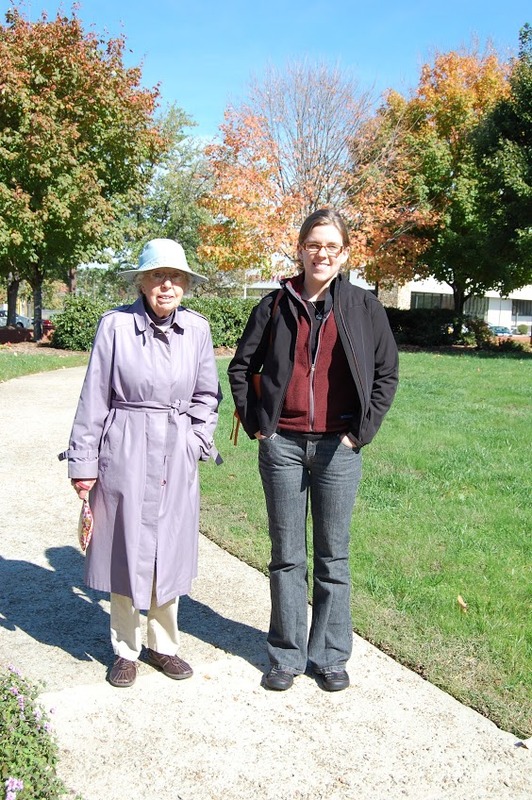 She looked forward to her daily walks, taking time to stop and say hello to her neighbors. The kids and I would join her, almost every week, and fall into the familiar routine she created with us. Gigi’s kitchen table, the setting for many tea & cookie visits. First, and foremost on visits to Gigi’s, we ate cookies. She sat us down at her almost-too big table, pushed against her oven door in her tiny kitchen. The treats were always laid out in advance complete with plates, napkins, silverware, cups, tea cups, and plates of carefully arranged goodies and Gramma fed us. When we would go and stay with her when I was a little girl, she fed us elaborate multi-course meals of fruit salad, scalloped potatoes, stuffing, baked fish, salad, muffins, and always something for dessert. I always hoped for the chewy molasses cookies, and I remember one time in particular she made an entire tin of these cookies all for me. In the more recent years though, the treats were more or less always the same store-bought items – iced pumpkin bars, chocolate dipped graham crackers, goldfish crackers, chocolate muffins, banana bread slices, pumpkin bread slices, Frito Lay chips, milk, and tea. It was during this snacking when we talked and caught up on the weekly happenings of her residence and aging neighbors, bridge games, movie nights, and gossip and I told her about raising two young children and working. The conversations would often drift to questions about the past – where did she acquire this set of china or what was it like living in Texas with two young boys in the early 1950s? Gramma loved to tell stories – she had a sharp memory and would often correct me on the dates of the events where I was present. 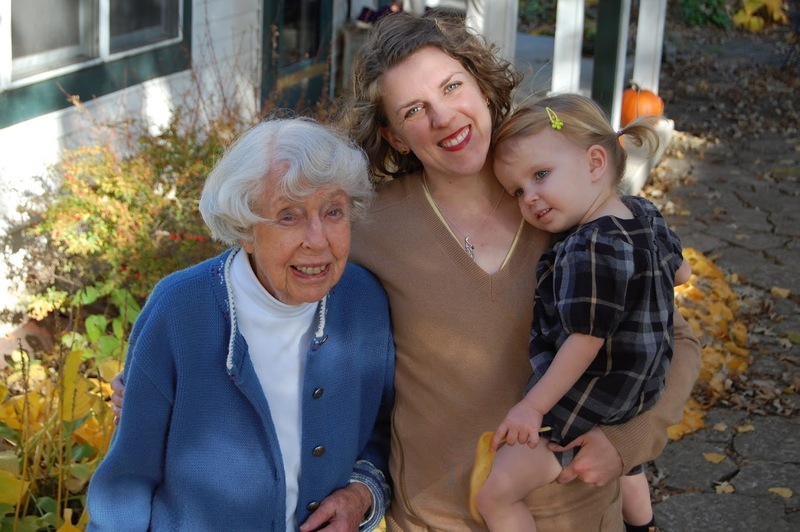 She loved to recount stories and discuss weddings, memorable trips, growing up during the Depression, working in Minneapolis hospitals as a dietician, and her preference for Mid Century Modern design. 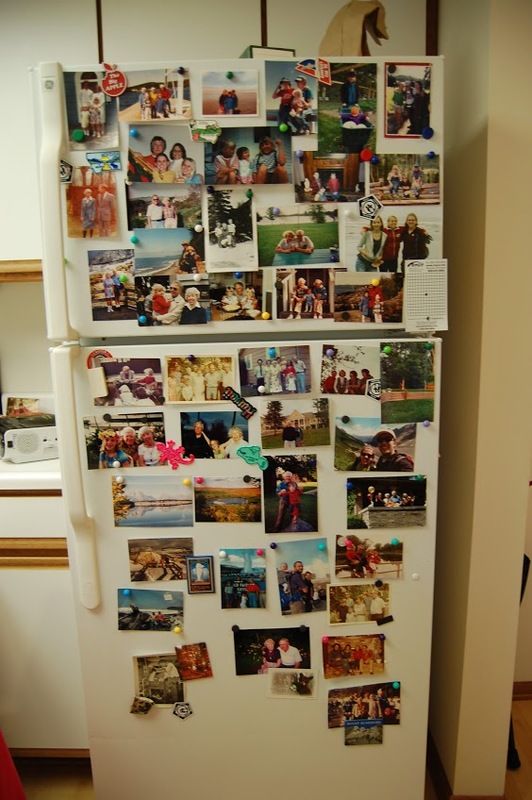 Her refrigerator covered in her most cherished photos. Every visit, without fail, while sitting in the cramped kitchen, I would find myself facing her carefully curated family museum of photographs on her refrigerator. Early upon moving back to Iowa, she had me hunting the aisles of Target to find small magnets that would not cover up the images she so cherished. Greta entertaining Gigi during brunch at our house. Through all of this conversation Greta would listen, interject questions from time to time, and tell Gigi of her world of daycare, music class, and Tae Kwon Do. Greta would always quietly demolish her Frito Lays (calling them Gigi’s chips) drink all her milk, and promptly ask for seconds. My salty snack loving child would take two or three bites of her chocolate covered graham crackers, then pull paper napkins out from the hiding place in the kitchen table, wrap them up, and announce she was going to take the rest home with her. Gigi would happily supply the baggies and supplement Greta’s small baggie with another tin heavily laden with goodies from the morning coffee bar in the lobby of her residence. 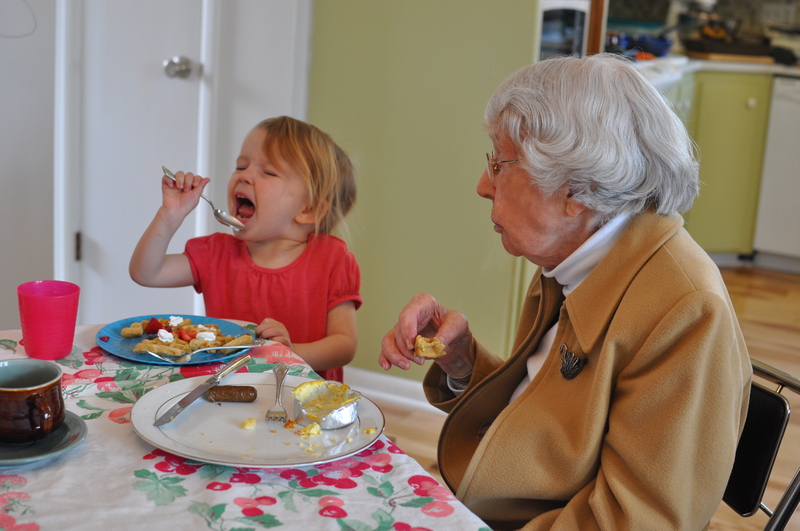 Gramma gave up baking and cooking her extravagant meals long ago, and since moving to Des Moines, found herself preferring the buffet-style communal meal once a day in the dining hall. An avid card player, she often won the coveted extra dining tickets to share with us. I admit, there were times when I wanted to avoid the dining room, as it always seemed to coincide with someone’s bedtime and an inevitable meltdown would ensue. I was always more upset by this than anyone else in the room, and looking back on this, I wish I had seen it through Gramma’s eyes, and her that of her friends. She was a lucky one. She had family in town. Family that visited, ate meals with her, walked with her, swam in the pool while she watched and laughed, and a great-grandchildren who enjoyed being paraded through the halls, smiling at all her friends in the process. My two children soaked up this attention and loved spending time with Gigi. We always walked down the long hallways, through the dining hall, stopping to admire the huge Christmas tree if it were winter, then head down the stairs, and into the swimming pool atrium. Greta would bend carefully over the water, tightly grasping the hand railings, and gingerly at first reach down to touch the uncomfortably warm and chlorine-laden water. Then, it was splash splash splash! Her brother got harder and harder to contain as he got older, realizing what he was missing out on. After much fussing from younger brother, I would cajole her into leaving, through the outside door when it was nice out, or retracing our steps through the building, when it was a bitter cold Iowa day. An early game of peek with Gigi when Greta was almost one. When we returned from our walking, Greta always convinced Gigi to play hide and seek in the small seating area at the end of her hallway. There was a table with a few chairs, a large fake plant, and a sofa table, and somehow the two of them would manage to play hide and seek in this small space week after week. Greta and Quinton brought out her playful side, one I don’t remember seeing as often when I was younger, but relished seeing her use with my kids. My most favorite recent memory is of Gigi leaning on her cane, standing behind one fake plant frond, while Greta shouts as loudly as she can, “I WONDER WHERE GIGI IS?! ?” Both are giggling hysterically. 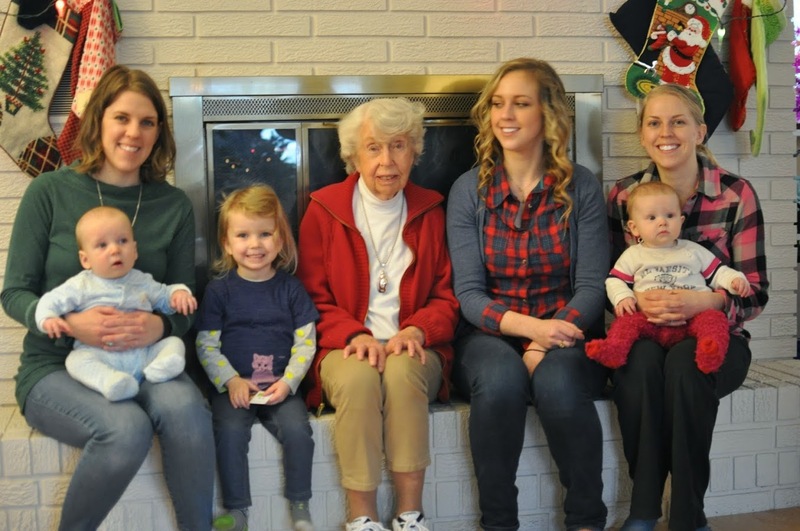 Gramma with her three grand-children and three great-grandchildren last Christmas. What a way to celebrate Christmas and her 90th birthday. After these antics, we wrapped up the visit, gathered shoes, coats, bags, cookie tins, and hauled the circus out the car. Gramma would always comment on how she didn’t know how I did it – carrying it all, keeping track of it all, working, and mothering. She always commented on how busy I was, and early on in these visits, I took it as a negative comment. I was an exhausted mother of two young kids, working part-time at a new job, freshly moved to a new town, juggling it all – of course I was feeling bitter and defensive. How I wish I could take those reactions back. In retrospect, I see that her comments were simply an observation by someone who has seen far more in her decades than I. Someone who surrounded herself with her family as often as she could – whether it was routine visits with great-grandchildren, or snoozing upright on a love seat while the family frenzied around her preparing Christmas, or gazing at her vast collection of family photographs. 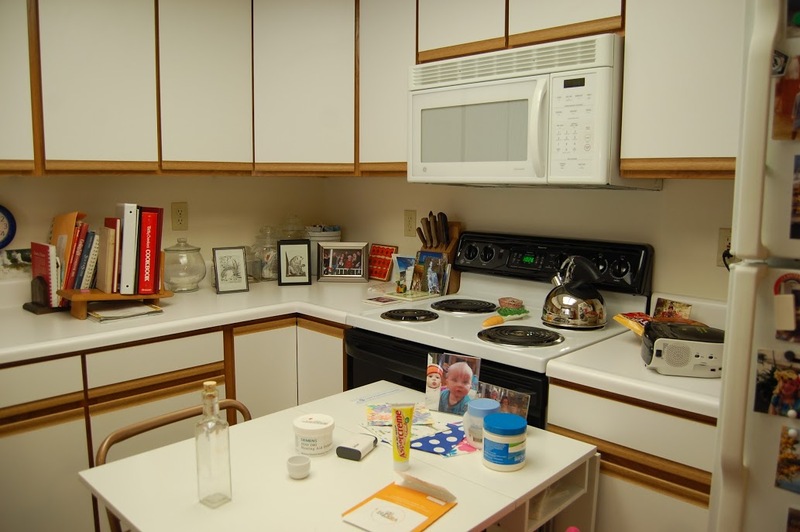 She often told me that her groupings of photos at her kitchen table got the through her physical therapy exercises while recovering from a broken arm. Exactly what she feared. Alone. Fall family photos before Quinton was born. Oh let me be wiser and make time for those who I love most. Or is it whom? Gramma would have let me know. So I may or may not use this blog the way I have in the past. You know, I love taking photos, drawing, painting, concocting new recipes, decorating and dreaming up new projects. My phone and cameras have a plethora of documentation of my creative outlets that are just begging to be shared. I just can’t bring myself to do any of that right now, this blog is just simply time away from my loved ones. It takes time to create things. I want to make time, but I don’t know that I want to give this time up right now. I had to write this all, and I try not to regret, but Gramma knew about this blog and always said, “You’ll have to show me someday, Chelsea.” I should have gotten out my phone and showed her all of this, for you always run out of somedays with the ones you love. Who knows why I didn’t. Someone probably needed a nap. Just know that there may be a few recipes on here in the coming months, from her two overstuffed recipe boxes.